Air drops are under way to deliver relief supplies to more than 100,000 Somali refugees in three camps cut off by flooding in north-eastern Kenya. A US Air Force Hercules transport plane has delivered tonnes of plastic sheeting, mosquito nets and blankets. The UN refugee agency says the rains have ceased for the time being, but if they start again, even air drops will become difficult. One million people have been displaced by floods. With escalating fighting in Somalia, the UN is worried about a possible influx of refugees into Kenya at a time when the camps are struggling to cope. It says the three camps at Dadaab, close to the Somali border, have been badly affected by the heavy rains of recent weeks. Roads in the area are impassable and the air drops are being used as a last resort to reach refugees left without shelter. 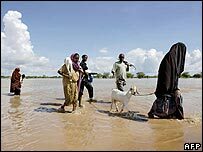 Meanwhile, the International Red Cross says hundreds of thousands more people are on the move in southern Somalia, trying to escape severe flooding there. The Red Cross, one of the few international aid agencies still operating inside Somalia, says the floods, coming so quickly after a long drought, have combined with years of conflict to make this one of the worst humanitarian crises in the world. Yves Degiacomi, a Red Cross water engineer, described the humanitarian situation in Somalia as "horrendous". He said: "When you fly over the region, all you can see is water and the tips of some roofs. "In addition to the lack of food and shelter, the terrible smell of rotting debris makes it even more difficult to cope with the floods." Floods have already killed more than 250 people in Kenya, Somalia and Ethiopia.